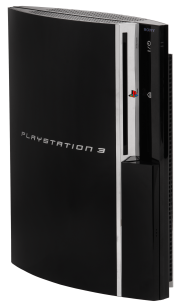 The Playstation 3 is a console created by Sony in 2006. It was infamous at launch for its $500-600 price tag and its lack of interesting exclusives, but over time, it gathered a plentiful library of great titles, both first-party and third-party. Most PS3 games tend to use different file formats for each game, and a majority of the first-party games currently cannot be ripped from. This page was last edited on 7 January 2018, at 16:27.